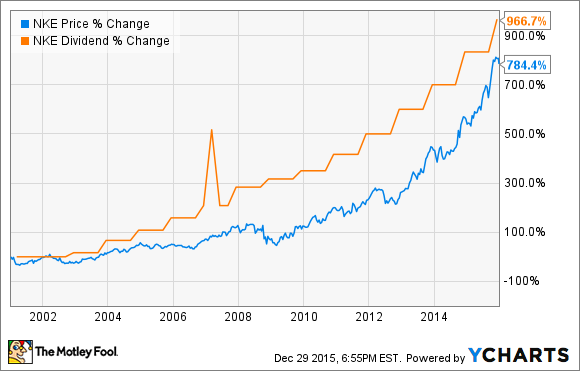 Will Nike Raise Its Dividend in 2016? Why all signs point to yes. If Nike's past is any indication, investors will see another dividend hike next year. A little over a month ago, Nike (NYSE:NKE) investors applauded after the sportswear titan approved an enormous $12 billion share repurchase program, announced 2-for-1 stock split, and increased its quarterly dividend (on a split-adjusted basis) by $0.02 to $0.16 per share. Of course, we already know the stock split is a zero-sum game that doesn't mean much for most Nike investors. And the $12 billion share buyback won't happen all at once, but rather gives Nike the ability to continue opportunistically repurchasing common stock over the next four years -- but only after it exhausts its current authorization sometime before the end of this fiscal year. By contrast, Nike investors will immediately enjoy the impact of its latest dividend hike, which effectively represents a 14% raise from its previous quarterly payout. But that raises the question: Since the new dividend equates to a relatively modest annual yield of 1% at today's prices, will Nike raise its dividend again in 2016? I certainly don't have a reliable crystal ball on hand. But based on Nike's history, I think it's very likely investors will see another dividend hike in the coming year. What's more, when Nike unveiled solid fiscal second-quarter 2016 results earlier this month -- including 12% currency-neutral revenue growth and a 21.6% year-over-year increase in earnings per share -- management indicated it has no plans of slowing down in the near future. During the subsequent quarterly conference call, CFO Andy Campion insisted, "Over the last 15 years, we have sustained strategic investment in the business while also returning nearly $25 billion to shareholders. That is a track record that we are proud of, and one that we will continue to build upon [emphasis mine]." It's clear we have the right plan in place against the backdrop of a global movement of fitness and sports. It's all adding up to incredible momentum for our business. But we are never fully satisfied. More than ever, we are focused on the areas where we can continue to get better, and making the necessary changes to ensure we continue to drive strong, profitable growth for the long-term. In October, Nike announced its new annual revenue target of $50 billion by the end of fiscal 2020, good for growth of over 63% from last fiscal year's revenue of $30.6 billion. Nike also revealed its long-term financial goal of maintaining high-single-digit to low-double-digit revenue growth, mid-teens per-share growth in earnings, and continuously expanding returns on invested capital. That might sound aggressive, but the plan was formed through realistic goals, including maintaining high-single-digit revenue growth in its developed geographies (North America, Western Europe, and Japan), mid-teen percentage growth in the largely untapped Greater China region, and the continued expansion of Nike's burgeoning e-commerce business to roughly $7 billion in revenue by the end of fiscal 2020. Regarding the latter, revenue from nike.com rose almost 50% on a constant currency basis in its most recent quarter, helped by the addition of e-commerce sites serving Canada, Switzerland, and Norway. And in a testament to just how early we are in Nike.com's growth, Nike plans to add e-commerce sites in the current quarter for the yet-to-be-touched Mexico, Turkey, and Chile markets. Perhaps it should come as no surprise, then, when Parker reminds investors at the beginning of each quarterly release that, despite its enormous size, "Nike is built for growth." Consequently, I see no reason many more annual dividend hikes won't be an integral part of that growth going forward.